Serengeti National Park Tanzania has a plentiful supply of life-changing safari moments within the almost endless Serengeti plains, but then one experience soars above the others in terms of memorability-the Serengeti Hot Air Balloon safaris. The Serengeti hot air balloon safaris all possible thanks to the gentle winds and the predictable weather patterns. 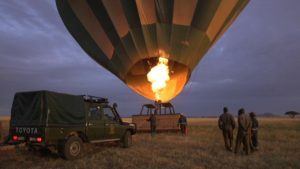 A Serengeti hot air balloon safari is a fantastic once in a lifetime experience to undertake on a Tanzania safaris tour, particularly suitable for a bird’s eye-view game viewing experience. When undertaking the activity as part of your Tanzania wildlife safari your safari guide picks you up by 5:00am for a drive to the set off point. A chance for early risers viewing though the coldness may require long shirts and trousers to be worn. The real Serengeti hot air balloon experience starts when the balloon inflates with the pressure from the heat swaying impatiently as it lifts. Assistants hold the basket steady (this is where you stand in), ensuring it remains equal during take-off. After then the heart pumping moment is when you lose touch with the ground and get to the space with views of the most spectacular sunrise ever. Here you have a view from above of the numerous wildlife below. Ascending you have a view of the sky lightening from purple to pink flooding the Serengeti with golden light. Above the Serengeti plains no matter the expertise of your pilot you are at the mercy of the wind and able to see what comes along your way or go where the wind takes you. Just let it be, capture the moments, have a great time and see what nature has to offer. After descending, you have a champagne bush breakfast as you recount of the memories. Serengeti hot air balloon safaris leave from three sites of Serengeti National Park in the central Serengeti, western Serengeti and southern Serengeti, here is what you see when you opt for any of the three sectors. In Central Serengeti, wildlife gathers year-round in the Seronera River Valley where there is permanent water. 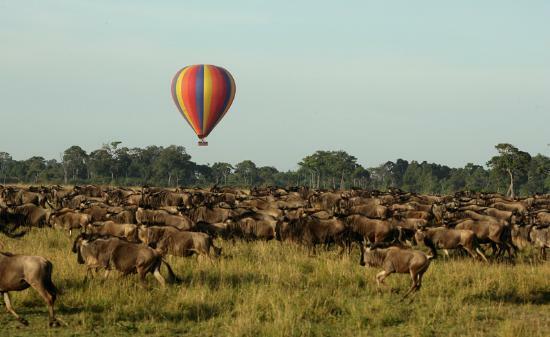 Opting for a balloon experience on a Tanzania safari within the Central Serengeti offers the chance to see several wildlife species and most of all the wildebeest during the great Migration that passes through around May and June. The Western Serengeti includes the Grumeti River, scene of dramatic crossings during the Great wildebeest Migration in June and July, when hundreds of thousands of gnu, brave the giant Nile crocodiles, and many perish while others detour to avoid the perilous river. This can be one of the dramatic hot air balloon safaris ever. In South Serengeti plains, the wildebeests assemble from December onwards, to calve in February, producing 8000 newborn every day on a three-week marathon. A great sight to behold and with a clear aerial view from above passing over, something you can’t do on a game drive. It is possible to charter special private balloon flights in the Grumeti Reserve for honeymoon couples on their romantic trip in the great plains of Africa. Before anything, remember to pre-book the activity for your safari to Tanzania due to its limited seating availability. Baskets are compartmented for comfort and security, accommodating 16 people for each one-hour voyage. Unfortunately, with age, only children over seven year, fit and active adults can be accommodated for the Serengeti hot air balloon experience. Carry a hat since it can get warm overhead. Because weight is a crucial safety consideration, passengers weighing over 120 kilos (265 pounds) may need to reserve two places. Remember to take your binoculars and DSLR camera to make the most of this highlight of your Serengeti National Park excursion. All year round you can incorporate a hot air balloon safari to your itinerary. For a specific time of travel check through the set off sites for the balloons and the best time for each. Hot air balloon experience is limited to some areas and when there is chance don’t hesitate to have another view of the park. In Uganda hot air balloon experiences can only be undertaken on a Uganda wildlife safari to Murchison Falls National Park-Uganda’s largest and oldest park. Prior booking with a Uganda tour operator is advisable too. Enjoy an incredible safari flying over the Serengeti National Park with uninterrupted views on an unforgettable, extraordinary adventure allowing you to absorb the magnitude of the park with amazing opportunities for stunning photographic moments.